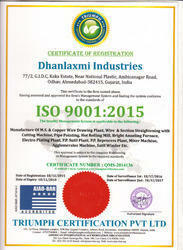 Established in the year 1988, at Ahmedabad (Gujarat, India), we, “Dhanlaxmi Industries”, are the leading manufacturer and supplier of superior quality range of Bull Block Machine Gear Box, Copper Wire Drawing Machine, etc. Our exclusive range includes Copper Section Straightening with Cutting Machine, Wire Straightening With Cutting Machine, Copper Wire Vacuum Furnace, Wire Rod Drawing Machine, Wire Rod Straightening With Cutting Machine, Intermedia Machine Gear Box, Copper Wet Rolling Machine, etc. The offered range is manufactured using high quality raw material which is procured from the certified vendors of the industry and advanced technology as per the defined quality norms. These are widely acclaimed by our valuable clients for their fine-finish, extended durability, high tensile strength and corrosion resistance. Our product range is manufactured using the most advanced machinery under the strict supervision of our skilled professionals. In order to meet the exact requirements of our precious clients, we offer the entire product range in different specifications as per their given details. Apart from this, we also offer these products at competitive market prices. We are supported by a huge infrastructure base which is well-resourced with the latest manufacturing technologies and machineries. Our huge manufacturing unit enables our skilled team members to manufacture our wide assortment of machines in bulk quantity with a high production rate. Apart from that, we have segregated our infrastructure into several sub-functional units such as production, quality testing, research & development, warehousing & packaging, sales & marketing, etc. All these units are efficiently operated by our highly skilled team of professionals who possess rich industry experience in their concerned domains. All our team members work in a harmonized manner with the clients in order to comprehend their specific needs and wants and manufacture the products as per the requirements. In our quality testing unit, we strictly inspect the entire range in accordance with all the national and international safety and quality parameters. Moreover, we have a huge and modern warehousing facility that enables us to keep the finished products and procured raw material safe from all kinds of hazards. For the effective deployment of our business processes, we have recruited a skilled team of professionals which enables us to deliver high quality range of machines to our esteemed clients. 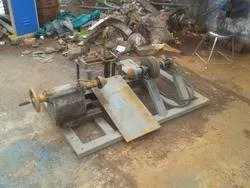 In addition to this, the entire range of machines is thoroughly tested on various quality parameters so that our clients can get the finest quality products from us. The raw material that is used in the production process is sourced only from the reliable sources of the industry. The procured raw material is also thoroughly tested on various quality parameters, before being sent to the manufacturing unit. Our rich industry experience helps us in catering to all specific needs and requirements of our precious clients. Further, our ethical business practices and quality conscious approach have made us the preferred choice of our clients. Clients can avail the offered machines from us at the highly affordable prices. Under the proficient leadership of our mentor, "Mr. Nimit", we excel in catering the emerging needs and requirements of our valuable clients in the most appropriate manner. His in-depth knowledge and vast industry experience assist us in positioning ourselves at the peak of success. Our organization is supported by a highly skilled team of professionals, who have vast industry experience in their respective domains. 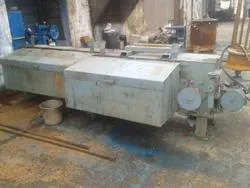 By utilizing their knowledge and experience, we are engaged in manufacturing and supplying a wide range of Copper Section Straightening with Cutting Machine, Wire Straightening With Cutting Machine, Copper Wire Vacuum Furnace, etc. Our team is segregated into various departments and works in close coordination with each other to function smoothly. Apart from this, we conduct different learning programs and workshops at regular intervals, for the training and development of our team members. 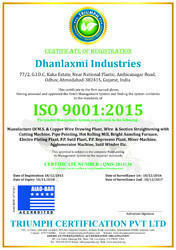 Since our establishment, we have set our main objective to standardize the quality of the entire product range. Our talented quality controllers make us highly efficient in offering the best quality machines to our esteemed clients. Our offered machines are precisely manufactured under the strict supervision of our quality controllers in order to check that these are in accordance with the set international quality standards. In addition to this, our quality controllers strictly monitor all the stages of production processes to ensure the flawlessness of the entire range. Our organization has a sophisticated research and development unit that help us in offering a superior range of Copper & Aluminum Wire Drawing Machine and Rod Break Down Machine at reasonable prices. This unit is a huge asset for our organization that enable us in catering to the changing requirements of clients in a best possible manner. These personnel have in-depth industry experience in this domain and keep engaged in market research. They play pivotal role in upgrading our manufacturing unit and offering reliable solution to our clients. Due to assistance of this unit, we have carved a niche for ourselves in the industry. We are instrumental in manufacturing and supplying a qualitative assortment of Bull Block Machine Gear Box, Copper Wire Drawing Machine, etc. The offered range of machines is manufactured in complete compliance with international quality standards.